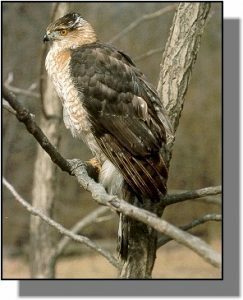 Comments: All three accipiters (Cooper's Hawk, Sharp-shinned Hawk and Goshawk) have short, rounded wings and long rudder-like tails that allow them maneuverability necessary in their woodland habitats. Cooper’s hawks are secretive, crow-sized accipiters that prefer mixed woodlands with patchy openings and edges rather than dense forests. Adults are slate gray on the back with rufous, barred chests. Their long tails have dark bands with a distinct white band on the rounded tip. Adults have reddish-orange eyes. Females are considerably larger than males. Distribution: From southern Canada through the United States and into northern Mexico, Cooper’s hawks can be found wherever there is appropriate woodlands and available prey. In Kansas, they might be seen year-round in wooded farm lots, tree rows, riparian woodlands or even in wooded city parks. They are more numerous in the eastern and central parts of the state. Food: Cooper’s hawks are efficient predators built for quick, short flights after its mostly avian prey. They sometimes hunt from an inconspicuous perch, or will fly low to the ground in an attempt to surprise and flush prey. They capture mostly small and medium sized birds, but occasionally catch small mammals, reptiles and amphibians.